Authorities at the Sunyani Nursing and Midwifery Training College (NMTC) have dismissed media reports that both male and female students of the college share the same sanitary facilities. The college authorities condemned the purported publication that has gone viral on various social media platforms describing it as untrue, unfortunate and unacceptable. Mr. David Amalba Ayinne, the Principal of the NMTC refuted the story, when he conducted Journalists round to inspect the level of infrastructural development in the college and said it was only female students being accommodated on campus. Established in 2004 with only 40 students, the Principal said the college was fast growing with current student population of 1,150 made up of 300 males and 850 females. He explained that college could boost of several physical infrastructural development projects such as sufficient lecture halls, modern sanitary facilities, ICT center and skills laboratories. Mr. Ayinne said with funding from its Internally Generated Fund (IGF), the college inaugurated a two-storey administration block constructed at the cost of GHC195, 000 and a modern library project. He added that plans were far advanced for the college to construct modern hostel to accommodate the males on campus. On academics, the College Principal said performance of students had improved in the past three years saying the college recorded 96 percent pass rate in Registered General Nursing (RGN), and 98 percent in Registered Nursing Assistance. 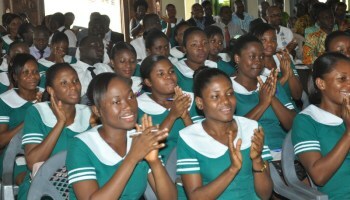 He said because of its infrastructural development, and improvement in student performances, the Kwame Nkrumah University of Science and Technology (KNUST) had approved for the college to start Degree programmes in Nursing and Midwifery. Currently, the college is also collaborating with the KNUST for students do top-up programmes and other courses. Mr. Ayinne said the door of the college was opened to the media at any time and appealed to Journalists and media practitioners to be circumspect in their reportage by endeavouring to cross check their facts well, whenever they intended to do any publications on the college. Meanwhile, Students Representative Council (SRC) has condemned the media reports on the sanitary situation at the college and the boys’ hostel as well. According to Gideon Amoah Kyeremeh, the President of the SRC no students have make complaint about the sanitary situation at the college and the boys hostel as well and described the media publication as a ploy to dent the image of the college. He told reporters that all the water closet facilities on campus and at the boys’ hotel were working, and advised the students to contact the student body whenever they have issues with management rather than rushing to the press.